The American Bar Association opens its annual meeting this week in Chicago with hundreds -- make that thousands -- of meetings, seminars, and programs for the various ABA sections, fora, divisions, standing committees, and other bar association entities. One of the programs being offered this week is a program on "How to Conduct Free Legal Research Online," sponsored by the ABA Standing Committee on the Law Library of Congress. The research program will be held on Friday, August 3, 2018, from 9:00 to 11:00 a.m. at the Hyatt Regency Chicago, East Tower, Lobby Level, Plaza Ballroom A. The program will explain research services available through the Law Library of Congress (the largest law library in the world) and other free, online collections. 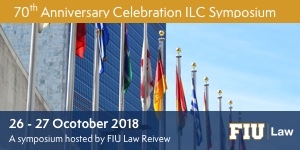 The program includes a strong focus on international and foreign law legal research as well as updates to federal legislative research. The program will be given by Barbara Bavis of the Law Library of Congress. At past ABA Annual Meetings this has sometimes been a standing-room only event, so plan to arrive a few minutes early. You'll be glad you did. Great! Please, also refer to the following article: Lee, Jootaek, Gatekeepers of Legal Information: Evaluating and Integrating Free Internet Legal Resources into the Classroom (February 7, 2012). Barry Law Review, Vol. 17, pp. 221, Spring 2012. Available at SSRN: https://ssrn.com/abstract=2000824.